In the Unicode standard, a plane is a continuous group of 65,536 (216) code points. There are 17 planes, identified by the numbers 0 to 16, which corresponds with the possible values 00–1016 of the first two positions in six position hexadecimal format (hhhhhh). Plane 0 is the Basic Multilingual Plane (BMP), which contains most commonly-used characters. The higher planes 1 through 16 are called "supplementary planes". As of Unicode version 10.0, six of the planes have assigned code points (characters), and four are named. The number 17 (which is not a power of 2) is due to the design of UTF-16, which can encode 16 supplementary planes plus the BMP, to a maximum value of 0x10FFFF, the last code point in plane 16. 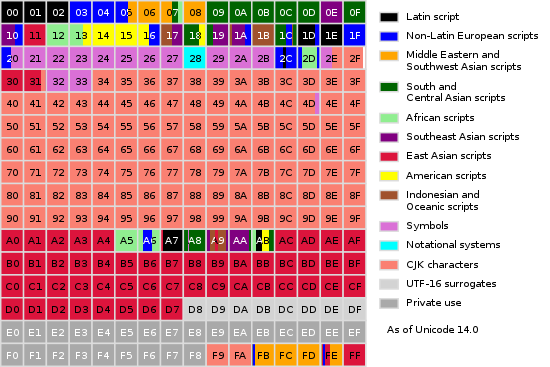 The encoding scheme used by UTF-8 was designed with a much larger limit of 231 code points (32,768 planes), and can encode 221 code points (32 planes) even if limited to 4 bytes. 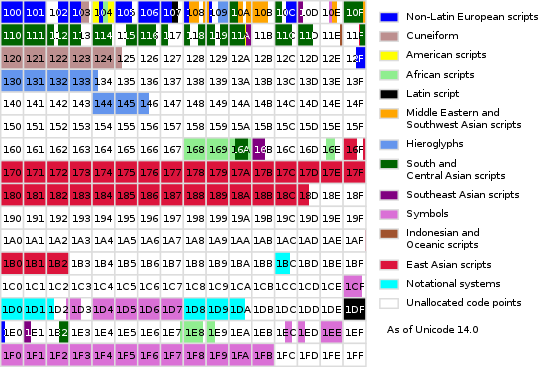 Since Unicode limits the code points to the 17 planes that can be encoded by UTF-16, code points above 0x10FFFF are invalid in UTF-8 and UTF-32. The 17 planes can accommodate 1,114,112 code points. Of these, 2,048 are surrogates, 66 are non-characters, and 137,468 are reserved for private use, leaving 974,530 for public assignment. Planes are further subdivided into Unicode blocks, which, unlike planes, do not have a fixed size. 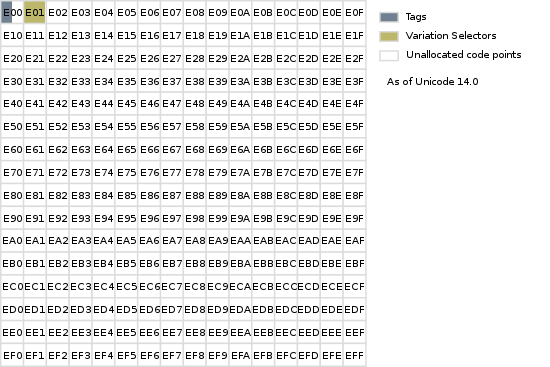 The 280 blocks defined in Unicode 10.0 cover 25% of the possible code point space, and range in size from a minimum of 16 code points (thirteen blocks) to a maximum of 65,536 code points (Supplementary Private Use Area-A and -B, which constitute the entirety of planes 15 and 16). For future usage, ranges of characters have been tentatively mapped out for most known current and ancient writing systems. ↑ Code points which have been allocated to a Unicode block. ↑ The total number of graphic, format and control characters (i.e., excluding private-use characters, noncharacters and surrogate code points). A map of the Basic Multilingual Plane. Each numbered box represents 256 code points. 65,424 of the 65,536 code points in this plane have been allocated to a Unicode block, leaving just 112 code points in unallocated ranges (48 code points at 0870..089F, 48 code points at 1C90..1CBF and 16 code points at 2FE0..2FEF). A map of the Supplementary Multilingual Plane. Each numbered box represents 256 code points. A map of the Supplementary Ideographic Plane. Each numbered box represents 256 code points. Planes 3 to 13 (planes 3 to D in hexadecimal): No characters have yet been assigned to Planes 3 through 13. Plane 3 is tentatively named the Tertiary Ideographic Plane (TIP), but as of version 10.0 there are no characters assigned to it. It is reserved for Oracle Bone script, Bronze Script, Small Seal Script, additional CJK unified ideographs, supplement characters for existing scripts, and other historic ideographic scripts. A map of the Supplementary Special-purpose Plane. Each numbered box represents 256 code points. ↑ "Unicode Data". සම්ප්‍රවේශය 17 June 2015. මේ පිටුව අන්තිමට සැකසුවේ 20 මාර්තු 2018 දින දී, 12:44 වේලාවෙහිදීය.